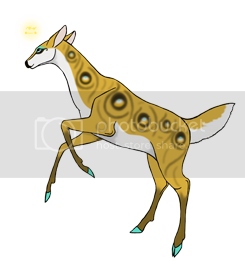 *Note - This deer's name is considered to be " " - however, he has been given the name "Rire" for all writing purposes. He views his name as " " and knows others only by their pictogram names (though they, too, have written names for the purpose of OOC writings). Written names have no meaning to him; he is unaware that such things exist. Speech: Rire does not speak (with the exception of calling/laughing), and has no comprehension of spoken language. Thoughts are written in italics. You are still welcome to have your deer interact with him here if you so choose. 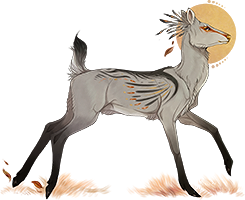 Set: Usually the great argus pelt, realdeer or fan/hands mask, and magpie or key or big antlers. *Note - Although only blue shows through the deer mask's eye holes, Rire's eyes are brown. History: Rire has no memories before his 'birthday,' the day he appeared in the Forest as a fawn. He has been known to vanish on occasion, and enter a "long sleep." 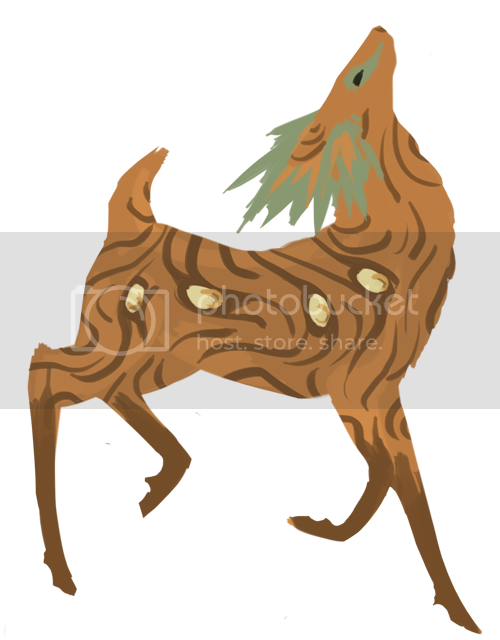 Rire is a true TEF deer; his appearance is exactly as it is in the Forest. Any mask he wears is truly a mask over a humanoid face, and his set may change depending on whatever other deer cast on him - though he generally returns to his "default" set after he gets bored with whatever's on top. 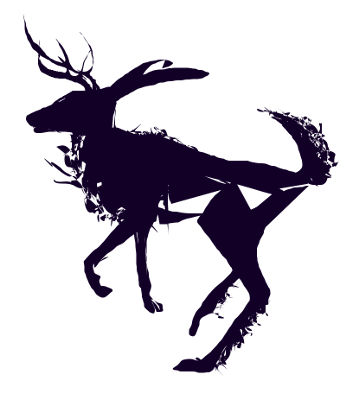 He may keep a mini spell handy and use it on a whim, and his mask and antlers change fairly frequently. The Argus pelt is his favorite, however, and he rarely deviates from it for more than a day. He has several favorite masks, and may switch between them depending on what sound he prefers at the moment. It's rare to see him without a mask at all, but it does happen from time to time. The face beneath is neither young nor old, and may even seem to shift between brightly childish and quite mature or serious. Rire never quite grew up. The memories of his fawnhood are bright in his mind, so he has a special spot in his heart for the little guys. Rire will often choose to cast spells on a fawn before a stag. Just because their magic doesn't last doesn't mean they can't play like everyone else, after all. He also tends to find himself in the company of fawns as often as or more often than he finds himself among deer his own age. Rire also loves flowers - especially the purple ones! He likes having his favorite antlers, though, so he doesn't wear flowers often any more. The hollow full of blue flowers is a favorite sleeping spot. He is more pacifistic than not, and chooses to ignore or back away from any challenges thrown his way - though that's not to say he wouldn't step up to defend a friend. He has also been known to step between combatants when they draw apart, and to push against his friends to discourage them from re-entering the fray. Although he will generally use his antlers against them in this case, he would never intentionally do damage with them. The young stag can also be quite mischievous; he has been known to find sleeping friends and change their sets to match his own or someone else's. He also thinks spell fly-bys are hillarious, and will often get rid of an extra spell by speeding through the forest and casting it upon the first deer he sees, without stopping to even see who his victim was. All of his little jokes are well-intentioned play, however, and overall are rather harmless (although sometimes a lot of sneezing is involved in undoing his work). Even when acting serious, it's not long before he can be caught laughing again. The buck simply doesn't have it in him to be dramatic for any remarkable length of time. That said, Rire is more often than not very quiet and quite shy and a little socially awkward in one-on-one situations, although he usually handles larger groups alright (since the focus is usually off of him). Many days he takes to sprinting through the Forest at random (because it's awful fun! ), only pausing long enough to circle and leap around those he knows or often sees (a weird way to say 'hello,' but it suits him just fine) or who he thinks could use a bit of randomness, before he's off again and bounding over the terrain. Although he's been around for a while (off and on), he doesn't know many deer very well, though he knows a handfull of names on sight and may greet them at least briefly if he knows who they are. Rire's recent activity is helping to change this, however; he is finding that he recognizes and is friendly with more and more deer. Dinah Moon - Fighting too near a fawn. Reconsidering her, currently. Gustiro - Won't let Rire near some friends. Curious of. Please note that these are the most common explanations for Rire's body language. They are not the only explanations. Stopping suddenly: Usually when Rire stops dead (in the middle of running, jumping, playing, spellcasting etc), one of my cats has jumped in my face or I am tinkering with a setting on my computer/adjusting the camera angle because I can't see through the trees. If he sits down suddenly, I'm probably adjusting something on the menu screen so that I don't lag/etc. Don't worry, he'll be back to normal in a minute. Leaving without a farewell: Assume Rire will be back within 5 minutes. My game probably glitched and I had to restart to fix it - or one of my cats shut off the computer (which happens way more often than it should). Even if I'm in a hurry, Rire will usually say farewell before he leaves for an extended period of time. Running/Leaping: Rire is happy and excited. If he's running in circles around someone, he's probably glad to see them. Walk/Hop: Happy and excited, but not as crazily so. Half-bow: Rire very rarely does a full bow. Instead, he'll usually half-bow and tilt his head to the side in a little nod. This is to be taken as a greeting and/or an expression of familiarity. Full bow: The full bow is usually reserved for farewells (in which case he'll double bow - see below), for deer Rire recognizes as older than himself, or for deer Rire is especially fond of. Farewell: Rire will often perk up/listen - "I think someone's calling me..." and then sad emote - "Oh, I have to go." Then he'll full bow twice and maybe attempt to nuzzle, if he's especially close to whatever deer are around, but this doesn't usually work very well (see below). Listening/Turning: Rire thinks he hears/smells someone familiar, and is trying to hear/smell better. If he hops in the direction he stops turning at, he probably wants to go find whoever it is he's after, though often he'll stay with whoever he's been playing with out of courtesy. Calling: Rire has lost track of whoever he was with, wants someone to join the group he's with, is startled, or is just messing around/happy. Point/Nod: "Join us," or "Follow me!" Point/Run: "Follow me!" - Rire will usually circle back a few times to make sure you're following before he runs off to wherever he has in mind. If you don't follow after a few moments, he may go off on his own. Aggressive motions: Thus far, Rire has never displayed serious aggression except while defending other deer. Any lowering of antlers, rearing, or 'taunting' is shortly followed by either dancing or laughing, unless something has spooked him - in which case he may just run or back away. Rire hates conflict. "Taunt": Rire usually uses this when he is anxious; it should generally be taken as a nervous prance, rather than a challenge. In general, the action is cut off about halfway through and Rire will pace in a nervous circle. May also be combined with the sad emote. Have I missed yours? Remind me! Track! THANK YOU RIRE for everything tonight--being a twin, being good company, being a LUCKY CHARM who keeps casting Karuna's right pelt on the first or second try. Some day soon we'll play properly since it is lucky for Ravus to find this fun and cool. :X Right now Karuna and I are trying to figure out some stuff with switching deer/spell data, so that's why we keep spellspamming and doing really weird things! I'm going to give proper attention to this page sometime soon, but for now just had to give a quick thank you. Apparently he's been saving antler spells for a while. YEESS thank you so much for helping us! D: I'm sure it was getting annoying when Karu would get his set then randomly disappear then show up all naked again hahah. "or sometimes will return a nuzzle and sometimes will back up and look stupid"
Haha, that's about the best description I've seen of it. Annoying, but then where would we be without some of TEF's glitchiness? This is slightly random but the pictures you have made for you deer are really pretty! I traced over a couple of screenshots, fixed the lines, and colored them in. The first one took maybe 20-30 minutes. 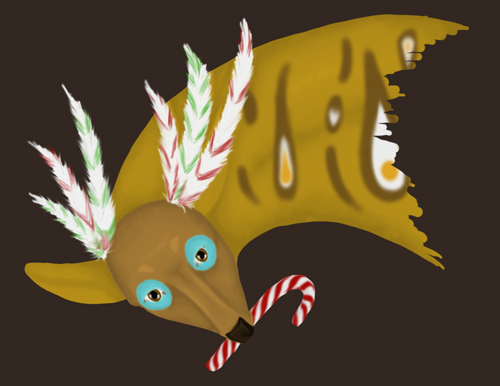 The antlers on the other one took forever though. It's that simple? Gosh, I've tried that so many times before and failed miserably. Yep! That simple! I do have a tablet and Photoshop Elements at my disposal, though. The ability to make layers helps a lot. "Do you know that "Rire" mean "Laugh", in french ?" I did not! I actually found the name in one of my 'name collection' notepad files, some years ago. I don't recall where I originally found it, but I suspect it had something to do with a flash game for something where it spat names out at you. Wow! This is gorgeous The css looks great, and the bio itself is marvelous...<3 Those pictures are so nice! Aivio, does Rire have a deer's face or does he simply wear the mask? "He also thinks spell fly-bys are hillarious"
Lmao, I keep rereading this and it still doesn't stop making me laugh. "Even when acting serious, it's not long before he can be caught laughing again." Hahaa, all I could think of with that picture was "This are serious Rire, this are serious post." >> But yeah, even when he's being all epically dramatic, like in that picture, you can still tell that he's ready to goof off at a moment's notice. "That said, Rire is more often than not very quiet and quite shy and a little socially awkward in one-on-one situations, although he usually handles larger groups alright (since the focus is usually off of him)"
... same way here. xD I think this is what has lead to many a tree-dancing session in our time. Really good way you have of describing him. xD You chose some good moments, too. "I also just realized that I forgot his feather antlers *facepalm*"
"Lmao, I keep rereading this and it still doesn't stop making me laugh." You should see him do it xD zzzzzzOOOM "wtf was tha-AAH why do I have peacock fur!" "This are serious Rire, this are serious post." "Really good way you have of describing him." I sure HOPE I can describe my own character, lol. Rire is lots of fun, though, so he's fun to write about. Also: my phone has learned how to spell "Rire," and considers it a word now. Win. will meet and play again! She sure liked it! Rire is a little sore today, after defending another deer yesterday evening, so he'll probably be a little more quiet than usual for a few days. It was nice meeting you and your deer, though! :3 We always enjoys good company. As do I, as do I. Hope Rire gets better! tikwid loves playing with this guy! i really like his bio, and how he doesn't speak but is energetic too. Tikwid has the best timing x3 It's like he has "Rire is spellcasting on a sleeping deer!" senses. They make a good team! What. I never tracked this? You're also using Vasska's account. You're also using Vasska's account." He was also standing over Sianna because he didn't want deer stepping on her while she was asleep. He took her pointing/head tilt to mean for him to get away from Sianna so she could play on the sleeping deer again. That's why he said no. Aww it's okay, Krystal was just very confused and a little saddened, as she missed playing with Rire! She knows Sianna too, so she didn't want to be mistaken for doing her any harm. Hey, long time no see? Im just wondering how Rire is, and how he has been doing. but anyways, yes, how is he? Rire is well :3 We haven't been in the forest much at all, recently, since I haven't been home - part of why you haven't seen him, I'm sure. But he's doing fine. Mnn, Im gald he is good. That is the same for my Dinamo, except for I havent been in the forest because of schoolwork. I will definitly be on more during winter break, but anyways, Dinamo is well too. So, anything to talk about on the fine evening? Uhm. I'm actually pretty boring, lol. I just got home from work and the library, and now I'm chilling out while my feet soak, and then I'll take my shower and bathe the cats and do a little laundry and cleaning since I have company coming on Friday, and then I'll work on the secret Santa gift for my coworker and maybe go watch Jackie Chan Adventures with my fiancee. I cant think of anything else to talk about, do you have anything? What're y'all doing in school? Anything interesting? Exactly. Yes, I just got out of school for the holidays too! Nothing really. Except learning History and Science and Algebra and english and PE and stuff. I believe 8th grade is boring. But High School is next year! I used to take ceramics, in high school. I've still got most of my pieces. One of my favorites is a piece I made in middle school my 6th grade year, though - it was a horse's head. High school is really not all that exciting. The biggest difference for me was just the size of the place. They tore down my high school a while back. It's kinda depressing - some good times back there. But that was almost four years ago, so I guess it's not really my problem what they do with the buildings, any more. Thats horrible! So far, none of my pieces have broken. I hope they all stay that way! but the poor horse! Did you prepare a proper burial for its shattered remains? Although, my junior high school is so boring, I think high school has to at least more eventful. I cant believe they tore it down, and I do see why you are sad, there are many memories that stay there. Good and bad all the same. But, was it old, or a health hazard, or was it due to fall? Why did they tear it down, do you know? My mom tried to glue it back together, but it's pretty messed up. They tore down the school because they're rebuilding and expanding. It was a pretty old building. I'm going to be out of the country from tomorrow until Monday, so I won't be able to reply again for a while. Dx Poor poor little horse. Dx Poor poor little horse. BUTANYWAYS. I see, thats a good thing, to expand, but still, all of your memories were lost. At least you can remember them! Alrighty, have fun wherever you go!!! And, Merry Christmas/Happy Holidays! Eh? Who, Crire? Nawh, he looks neat :3 I've been stalking his bio a bit. Rire is really intresting I'm tracking this for sure. By the way,were you on today? I believe my Phobos met Rire near the pond,dancing.